Today’s topic(s): Pope’s message for Lent, a Pakistani martyr, the Pope’s new book, Bishop Chris Coyne from Boston, ultrasounds for life, the Church using the media to spread the message, and WQOM, Boston’s new Catholic radio station. Today’s guest(s): Fr. Roger Landry, executive editor of The Anchor, the newspaper of the Fall River diocese, and pastor of St. Anthony of Padua parish, New Bedford; Gregory Tracy, managing editor The Boston Pilot; and Maria Bain, station manager for WQOM 1060 Boston. A summary of today’s show: Pope Benedict’s message for Lent 2011 dominates talk of world news, while the example of a martyr for the faith in Pakistan gives us cause to reflect. We celebrate one of our own being ordained an auxiliary bishop for Indianapolis, as well as the donation of an ultrasound machine to promote the cause of life. 1st segment: Scot introduces Susan Abbott as his co-host. She is the director of the Archdiocese of Boston’s Office for Religious Education. She reflected on the launch of Catholics Come Home on Ash Wednesday. “It was an amazing experience. When I saw [the TV commercial] on the big TV at the press conference, it took my breath away,” she said. “You want people to know the beauty and goodness of the Church.” She found the whole day to be emotional and uplifting with a sense of hope despite the difficulties that surround us. 2nd segment: Gregory Tracy and Fr. Roger Landry join the program to discuss news from around the world. First up for discussion is Pope Benedict’s message for Lent 2011. Pope Benedict is emphasizing our baptism in his Lenten message. Fr. Landry says the ashes of Lent remind, marked as a cross on our foreheads, recalls our baptism when a cross is marked on our foreheads with holy water and holy oil. The more we can enter into our rebirth through baptism, the more we can enter into Christ’s death and resurrection. As a father of 10, the experience of baptism is familiar for Gregory Tracy. Baptism is the door through which all other graces flow. The other children get excited as well, seeing the beauty of an experience we don’t begin to fully understand until much later in life. It is unfortunate that baptism is often the forgotten sacrament. The rite of Election for those being prepared to be received into the Church at Easter will happen this weeked at the Cathedral of the Holy Cross. Susan Abbott says she loves the pope’s words that in baptism, we are claimed for Christ. Baptism is not a date, but a way of life. The RCIA is a school for baptism. Fr. Landry says Lent is like baseball spring training. The multimillionaire ballplayers are getting back to the fundamentals of baseball. We do the same thing in Lent by getting back to the basics: taking the time to pray, learning how to deny ourselves in order to say no to temptation and say yes to God, learning how to love one another as Christ has loved us. We put God first in prayer, put others second through almsgiving, and ourselves third through fasting. The Holy Father this week commented on the murder of Pakistani government minister Shahbaz Bhatti, the only Catholic in Pakistan’s government. The Pakistani Catholic bishops are moving to have him recognized as a martyr for the faith. Gregory says that this is just the latest of numerous incidents of anti-Christian violence that seems to be escalating throughout the world. Fr. Landry says we are, first, called to pray for our persecuted brothers and sisters. Second, we are called to work with our own government to work for the right to religious freedom everywhere. Third, we should elevate the example of the great martyred heroes of the faith. Bhatti had said beforehand that he would probably die for his work for his Christian brothers and sisters. A Pakistani bishop of Gregory’s acquaintance once remarked at how empty he found American Catholic churches. In Pakistan, people are literally dying to get to Mass, yet with our freedom to worship so many do not. 3rd segment: Continuing the discussion with Gregory Tracy and Fr. Landry, we turn our attention to national news. Last week, Bishop Chris Coyne was ordained an auxiliary bishop in Indianapolis. He is a former spokesman for the Archdiocese of Boston and was Gregory’s boss. Gregory recalls the difficult times of the abuse scandals and how then-Fr. Coyne was always a straight shooter, who always said what he knew and if he didn’t know, he would say that. It is unusual for an auxiliary bishop to come from outside the diocese in which he is ordained (except for certain Spanish-speaking bishops). Fr. Landry says there are two schools of thought: Some say it’s great to promote from within because they know the place and the needs, but others say an outside bring a fresh perspective. We’re starting to see more bishops being appointed from outside the diocese for that fresh perspective and a cross-fertilization of best practices from other places in the Church. Bishop Coyne also said that we can never lose sight of the fact that the Church is about the work of evangelization. All that we do as Christians must be performed in light of this truth. 4th segment:Turning their attention to local news, Scot, Susan, Gregory, and Fr. Landry, The Pilot has a story about the donation of a new ultrasound machine to a pregnancy help center in Brighton. With all the local media outlets present at the launch of Catholics Come Home, as a journalist, Gregory said it was a joyous moment. It is great to have all the media turn out for something positive for a change, as opposed to covering a negative development. There were tough questions to be sure, but they were appropriately handled and Cardinal Seán shined. Scot reflected that to have all the media there for the biggest evangelization effort in a generation is awesome to understand that the Church believes the media is a huge tool for evangelization. Fr. Landry said the Pope has been calling us as a Church to join in the new Aeropagus, the place in the city of Athens where the Gospel was preached to the Gentiles. He called the entire Church to take advantage of this gift of the Internet, the new media, and the digital continent. The message is the same, but the means we use is constantly changing. 5th segment: Scot talks with Maria Bain, station manager of WQOM. She’s been making parish presentations throughout the archdiocese and has been invited to over 80 parishes. The goal of Catholic radio in Boston is not just evangelize, but also to help parishioners become more involved in their parish and to reconnect lapsed Catholics. 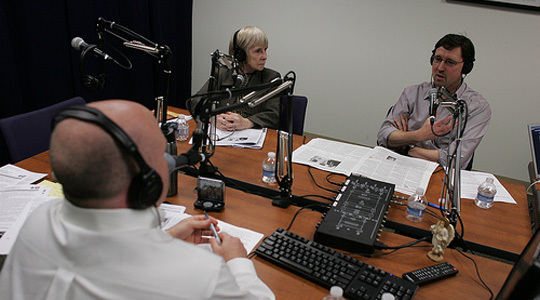 The Good Catholic Life, as a locally based radio program, helps WQOM to connect with the local market in a significant way. The Station of the Cross network is also preparing for a listener conference at the TD Garden in Boston on August 6 with Fr. John Corapi. Tickets are available online and through Ticketmaster. There are even opportunities for some to have dinner with Fr. Corapi. All proceeds will benefit WQOM. Discounts are also available for groups. One of the priorities for WQOM right now is to find a benefactor who will donate office space of at least 1,000 square feet within 20 miles of the transmitter in Natick. Ideally, it will have room for offices, a studio, some conference rooms, and even a chapel. Interested parties should contact Maria at 617-939-5207 or email mariab@wqom.org.